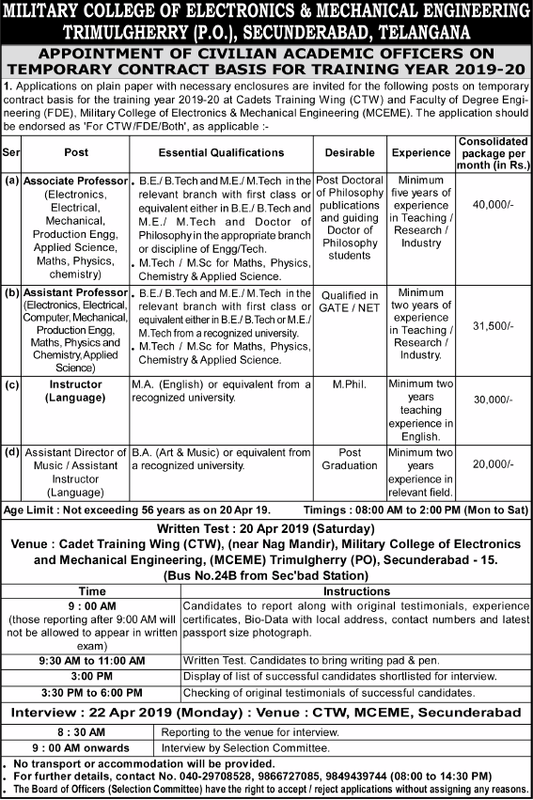 Military College of Electronics and Mechanical Engineering, Secunderabad has advertised in THE TIMES OF INDIA newspaper for recruitment of Associate Professor / Assistant Professor / Instructor / Assistant Director of Music / Assistant Instructor (Language) job vacancies. Interested and eligible job aspirants are requested to appear for written test on 20th April 2019. Check out further more details below. How to Apply: Interested candidates are requested to appear for written test along with application on plain paper with copies of certificates and recent passport size photo to the walk-in address given below. Written Test Date: 20th April 2019. See further instructions in the official advt copy attached below.